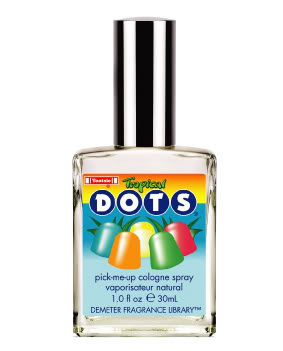 This Tropical Dots cologne spray by Demeter Fragrance Library was a big disappointment. I love the smell of Dots- a vaguely powdery subdued fruit melange that I believe would smell delicious upon my skin. This Tropical Dots perfume, though, emits a strident tutti frutti aroma that doesn't come even close to the actual candy. Which is surprising because no matter what one thinks of Demeter's fragrance choices, they tend to be almost alarmingly accurate. As I said, major disappointment. I vote that Demeter should make a Red Vines scent- I'd bathe in it.